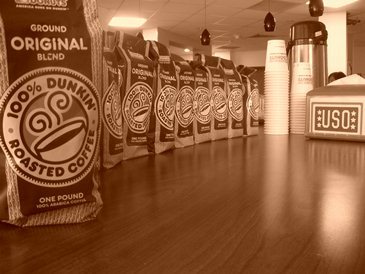 ‘Tis the season for giving back at the Dunkin’ Brands corporate headquarters. While Dunkin’ Brands employees join together throughout the year in support of a number of causes, we’re excited to shine a spotlight on our annual Coffee for Our Troops donation drive. For the past five years, Dunkin’ Brands employees have celebrated the holiday season by personally donating coffee to United States military members serving overseas. This year, we’re thrilled to report that employees donated more than 2,700 pounds of coffee! In addition to donating coffee, the troops overseas also received a letter and holiday cards from Dunkin’ Brands employees thanking them from their service. As a result of the Coffee for Our Troops donation drive, we’ve received many thank you cards, pictures, and flags from appreciative service members. These tokens of appreciation and mementos are always cherished by our employees. 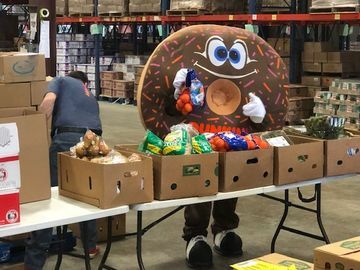 The annual Coffee for Our Troops donation drive during the holiday season is one example of how Dunkin’ Brands has supported members of the U.S. military over the years. 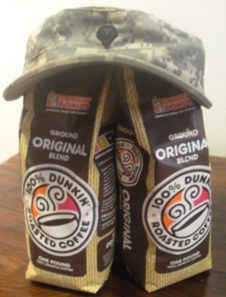 In 2003, Dunkin’ Donuts launched the Coffee for our Troops program. Each month, the company holds a drawing to randomly select at least 50 troops to receive one case (24 pounds) of Dunkin’ Donuts coffee. We increase that number to 100 cases during the holidays. In 2010, Dunkin’ Donuts launched its first national Coffee for Our Troops cause marketing program in-stores to provide coffee to the United Service Organizations (USO). As a result of this program, we were able to deliver coffee to more than 80 USO centers nationwide impacting more than 3 million service members and their families. To date, Dunkin’ Brands has donated over 230,000 pounds of coffee to troops overseas through Coffee for Our Troops programs. 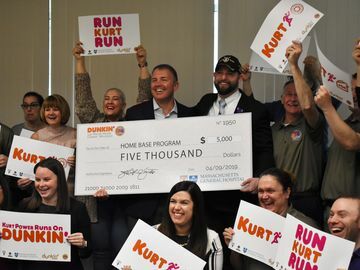 Since launching a national partnership with the USO in 2010, The Dunkin’ Donuts & Baskin-Robbins Community Foundation has donated $107,500 to the USO to support its mission to provide morale, welfare and recreation-type services to troops and their families. 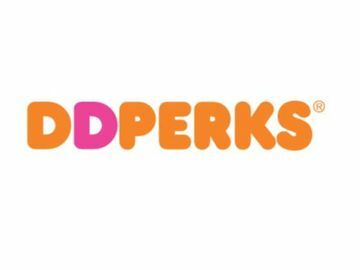 For more information on The Dunkin’ Donuts & Baskin-Robbins Community Foundation, click here, or “Like” us on Facebook.